This article shows you how to install and operate multiple versions of Trados on the same computer. If you’ve ever dealt with localization issues for your projects and dealt with multiple translation agencies, you may have had the need to use multiple versions of Trados in order to complete your projects. Trados is a CAT (Computer Aided Translation) tool which operates inside a text editing environment, such as Microsoft Word and is installed as a VBA (Visual Basic for Applications) application using the aid of a Microsoft Word .dot file. These .dot files are installed during the Trados installation process automatically, and the end user/installer does not need to worry about the intricacies of their operation or interaction with Microsoft Word. The challenge occurs when a freelancer or company needs to operate multiple versions of the Trados software on a single computer. Because Trados is installed within Microsoft Office Word’s Macro environment and is hot-key aware, i.e. allows for input and operation using special key combinations, there can only be one version of the Trados software operating at any one time. 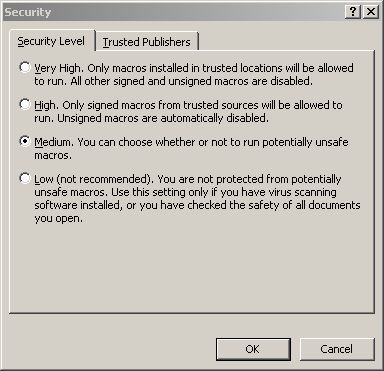 Simply put, when Trados is operating within Microsoft Word it monitors for special key combinations and upon detection activates the required Macro e.g. Move to next section. When two versions of the Trados VBA application are installed and running within Microsoft Office Word, the first registered (installed) Trados VBA will capture all the special key combinations and not allow the use of the second version. To combat this default behaviour we need to disable the undesired version before hitting the special key combination or using the Trados toolbar within Word; all of which activate a Macro for that version of Trados. Although the following steps will outline the instructions required to install Trados version 6.5 and 7 side-by-side on the same computer, the procedure is identical to other versions of Trados, as well as other CAT products such as Wordfast. The following instructions assume that you are using Microsoft Office 2003, however previous versions as well as Microsoft Office 2007 use similar procedures, so finding the correct component and disabling it shouldn’t be a problem. Install Trados 6.5 as per normal installation instructions. Please note, installing Trados 7 on top of Trados 6.x will disable Trados 6.x in Microosft Word (but won't damage or alter the installation). We have reversed the installation procedure to ensure that both versions are enabled when Microsoft Word starts. Start Microsoft Office Word. You will notice that there are two Trados toolbars and two Trados menu’s. In the Global templates and add-ins group uncheck the versions of Trados that you do not want to use. For example, to enable Trados 6.5 (or 6), ensure that TRADOS6.dot is checked. If you would like to use Trados version 7, ensure that TRADOS7.dot is checked. Leave only one version of Trados checked (the one you wish to use). Notice that in our example graphic we also have the Wordfast macros available. 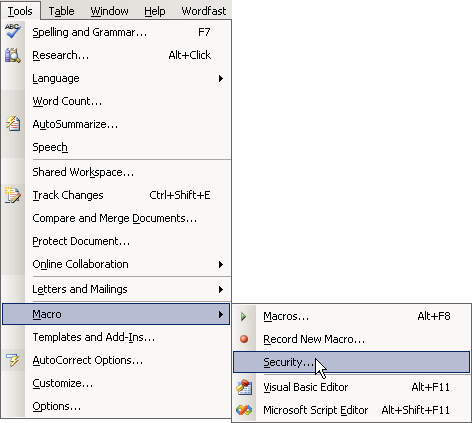 At this stage your Microsoft Office Word menu bar should only contain one Trados toolbar as well as only one Trados menu option (the desired version). To change between versions of Trados repeat steps 1 thru 4, selecting the appropriate macro .dot for the version you wish to use. 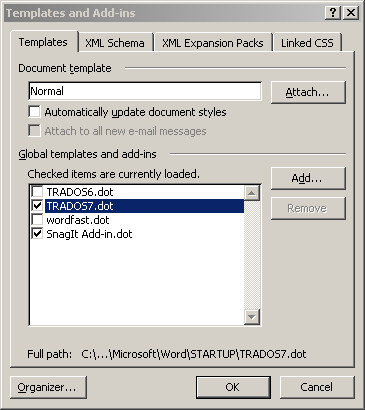 By default Trados 7 will install itself as the new .dot template in Microsoft Word. 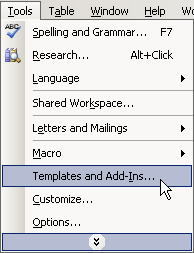 However, if you use Trados 6 more often than version 7 it would make sense to set it up as the default in Microsoft Word. The following instructions will allow you to change the default to version 6 when Word opens. All the .dot’s which should start automatically live in this folder i.e. if you would like to setup version 6 to start automatically, rename TRADOS7.dot to TRADOS7._ot and copy TRADOS6.dot into the folder. To clarify, the defult Trados version which will be loaded by Microsoft Office Word, will be the one which was installed last. If you installed version 6.5 after version 7, verson 6.5 would be the default Trados toolbar. This white paper discussed how Trados integrates with Microsoft Office and Word. In situations when a freelancer needs to run two versions of Trados on the same computer, the white paper demonstrated a method for achieving side-by-side installation of Trados without major headaches.